I found myself in the San Fernando Valley on a Saturday afternoon, and Blue Dog Beer Tavern was nearest untried burger joint on my lengthy list of cheeseburgers to sample in Southern California. Parking was free in the attached lot. It was late on a Saturday afternoon, and the establishment was just starting to fill up for the dinner rush. The first thing that I noticed was that the walls were covered with framed dog photos. The second thing that I noticed was the wonderful smell of cooked meat filling the air. I hoped for good things as I ordered my burger. My meal took about 15 minutes to arrive. As I waited, I watched many fine-looking burgers make their way to diner's tables. In particular, the sear on the burgers leaving the kitchen was remarkable. I also took note of an extensive beer menu. Blue Dog Beer Tavern had a huge bottled beer selection, and 8 beers on tap. The Beef: The burger meat at Blue Dog Beer Tavern was 1/3 of a pound of 80:20, grass-fed, wet-aged, Chuck from the Cysco Foods. This was a fresh/never-frozen product. The fat content was the customary 20%. I didn't expect much of the Cysco beef, but I was pleasantly surprised. "Surprised" like discovering that Superchunk had covered Bananarama's Cruel Summer, and it was pretty darned good. Check it out. When I bit into my burger, I found that the beef was loosely packed and just a little on the crumbly side. The texture was brisket-like in that the tender beef fibers lingered on my palate. This was a pleasant surprise. The flavor was mildly beefy, and there was a faint taste of funk from the wet-aging. The Chuck was also sufficiently juicy. The beef, while not spectacular, was certainly better than average. The Seasoning: The exterior of the patty was treated with just enough sea salt to round out the bite, the sea salt brought out the beefy flavors in the burger. The Sear: The sear on my burger came out looking a little anemic compared with the other burgers that I had witnessed leaving the busy kitchen. Still, it was adequate, and it provided just enough crunch to make the bite interesting. The Preparation: The irregular 1/3 pound burger patties at Blue Dog Beer Tavern were portioned up during morning prep. The burgers were smashed on a hot griddle and turned once. This was a great way to create a tender and juicy burger. This method of minimal handling did not serve to create chewy protein bonds in the ground beef. Even though the default cooking temperature was Med-Rare, I went with Medium to melt more of the collagen and develop some beefier flavors. The kitchen faithfully honored my request. 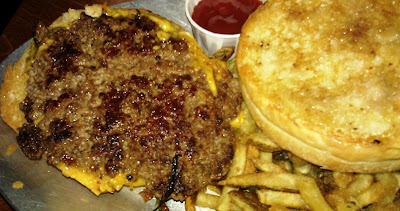 The Cheese: This was one of those rare cases where a medium Cheddar worked on a burger. 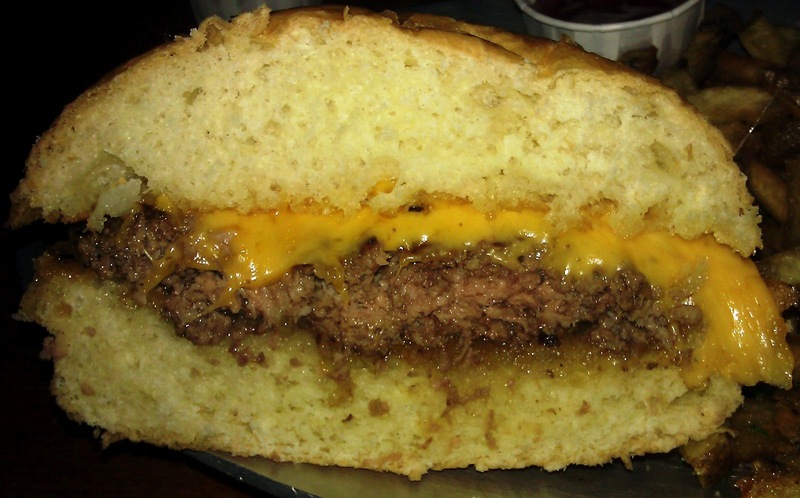 The chewiness of the Cheddar was precisely the right texture to reign in the looseness of the beef. The combination of the firm cheese and crumbly ground beef delivered a solid bite. The flavor of the cheese was barely noticeable. The Bun: Blue Dog Beer Tavern employed a mildly toasted, caramelized, potato bun. It sounded fancy, but it was neutral and adequate. The bun did its job, yet it never demanded any attention of its own. The Meat To Bun Ratio: This was tight. The Fries: The fries were peel-on and hand cut. These babies were prepared using an elaborate 9-step cooking process, which involved lots of cooking, brining, and chilling. The result was perfectly crisp fries with creamy centers and a strong earthy flavor. They kitchen finished the fries with a nice sprinkling of sea salt. The chili on the chili fries was of the creamy variety that I have come to expect of Southern California. It was rich and tasty. The Toppings: All of the vegetation was fresh and crisp. The bacon, was overly salty, and it tended to mask the flavor of my companion's burger. The Value: Two $10 cheeseburgers w/ fries and two soft drinks at Blue Dog Beer Tavern came out to about $34 with tax and tip. Considering the quality of ingredients and preparation, the value was better than average. Burger Review : Blue Dog Beer Tavern served up a fine burger and finer fries. The place was clean and bustling. If you find yourself in Sherman Oaks with time to kill, this is a fine place to do so. The burgers were solid, and the beers were varied. 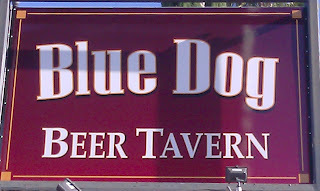 I ate at the Blue Dog recently. I liked the ambiance and the service was remarkably friendly. The burger was as you described. That is, if one knows how to read you. Prior to going to Blue Dog, I misremembered your review as being more favorable than it actually was. Also, I forgot to mentally reduce your review by one star, which I've found is a necessary counterbalance to your inherent and irremediable burger-nicety. In other words, there was some thoroughly mediocre noshing going on in Sherman Oaks one Saturday afternoon. By the way, you allege that you "found yourself" in the valley. But how do we know you didn't go to Sherman Oaks intentionally? Or that you know people from Sherman Oaks? For all we know you even like the place. I don't usually like burger buns, but this was my favorite bun in memory. It was moist, sweet, and well toasted & buttered. I could have eaten it by itself and been happy. The burger actually got in the way. I thought it was the perfect meat-to-bun ratio. Which you described humorously as "tight". Not sure if that's hip-hop speak for "awesome". Or you think the bun was a little small. I don't understand what they/you mean by the bun being caramelized. I understand the concept of caramelized, but how is that done with a bun? Fully agree about the cheese, as you say, it was "barely noticeable". You, sir, are a hoot. You're interpretation is spot on. 4 Bites means better than average. The burger was certainly not spectacular, but it was on the upper in terms of quality of ingredients. I found the beef sort of surprising. The carmelized bun....I sort of assumed that this was courtesy of the bread vendor. As for finding myself in the valley--yea, I was there for a movie at The Arclight. 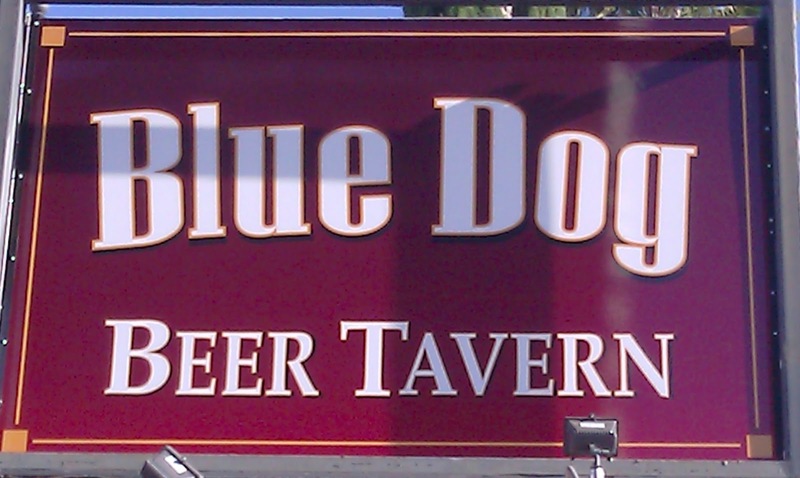 The Blue Dog is a nice and pleasant place to go. I don't suppose that I would go back, but it wasn't bad.